Bipartisan group says it'll pass new Iran sanctions legislation as soon as possible, despite agreement reached Saturday. A group of top senators vowed Sunday to impose more sanctions on Iran, one day after the US and other P5+1 countries agreed to ease sanctions on the country in exchange for Iran's curbing its nuclear-enrichment program. The group of 15 senators included Democrats Bob Cardin of Maryland and Bob Menendez of New Jersey, as well as Republicans Bob Corker of Tennessee and John Cornyn of Texas. Corker, the top Republican on the Senate Foreign Relations Committee, told “Fox News Sunday” that Iran was celebrating because its deal overnight with the U.S. and five other world powers allows it to continue to enrich uranium while billions of dollars' worth of crippling sanctions are lifted. “They’re spiking the ball in the end zone,” Corker said. He also said his greatest concern was that the Obama administration wouldn’t follow through on the terms of the deal – including daily inspections on Iran's nuclear facilities. He also repeatedly said he didn’t want the interim deal to “become the norm” and suggested Congress is ready to reinstate sanctions and impose more. “I think you are going to see on Capitol Hill, again, a bipartisan effort to try to make sure that this is not a final agreement,” he said. Senator Ben Cardin, a Democrat from Maryland, agreed: “We will not stand by (and) just let this be the final deal.” Cardin also appeared on Fox. Speaking on the ABC program “This Week,” Republican Saxby Chambliss, vice chairman of the Senate Select Committee on Intelligence, said Congress may allow the administration to see how the deal works over the next six months. But he added that in the future, there could be “a strong movement in the United States Senate to move ahead to tighten sanctions” on Iran. 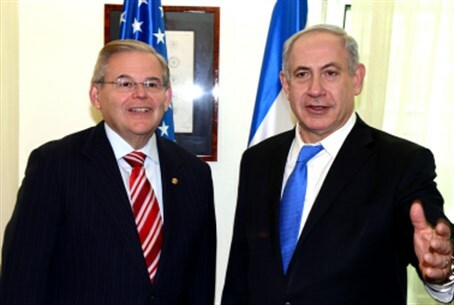 Menendez, the foreign relations committee chairman, was among the Democrats most critical of the deal.